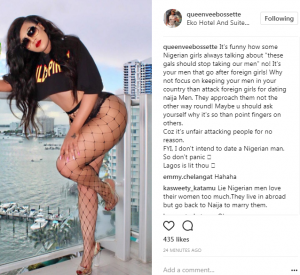 Kenyan socialite, Vera Sidika who is currently in Nigeria took to her Instagram page to address Nigerian girls who say foreigners like her are taking away all their men. 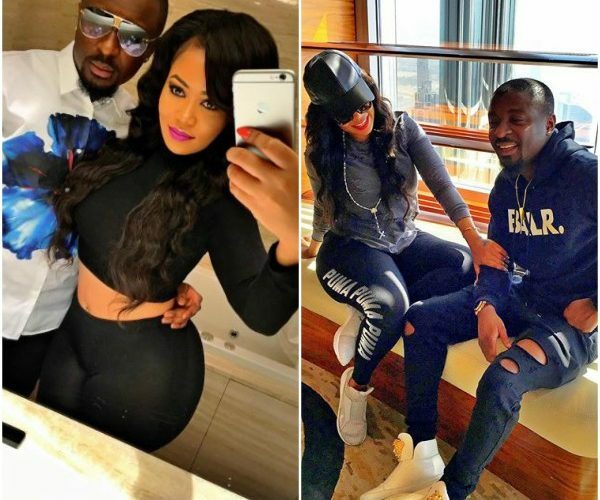 Vera who broke up months ago with Yomi, her Dubai-based Nigerian boyfriend hung out with Ubi Franklin yesterday in Lagos and that got tongues wagging. “It’s funny how some Nigerian girls always talking about “these gals should stop taking our men” no! It’s your men that go after foreign girls! Why not focus on keeping your men in your country than attack foreign girls for dating naija Men. They approach them not the other way round! Maybe u should ask yourself why it’s so than point fingers on others. Coz it’s unfair attacking people for no reason.